forestière: 24 - maple syrup, oh my! 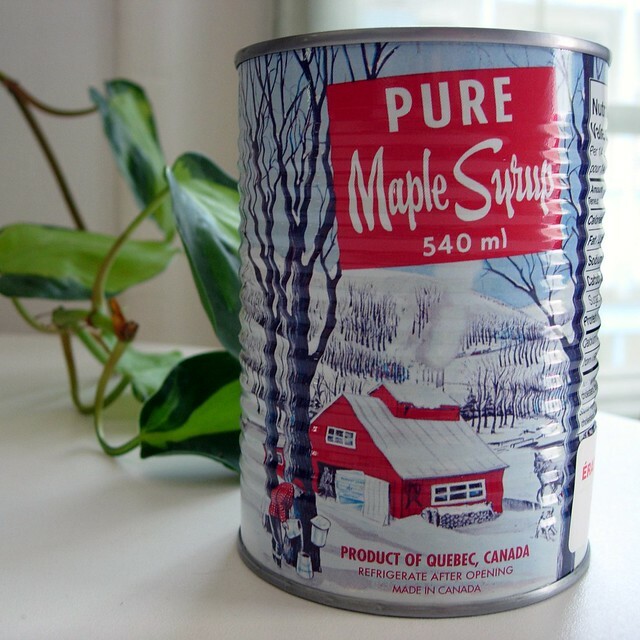 i might be biased because i am Canadian, but i think that pure maple syrup is the most amazing "secret" ingredient ever. i cook, bake, and garnish with it all the time, and i am likely to lick up every last drop so as to not let any go to waste! my favourite is the darkest, richest (i.e. the most "natural" and mapley) i can find, but i also enjoy medium and amber grades, which seem to be the most popular at the markets here in Montreal. 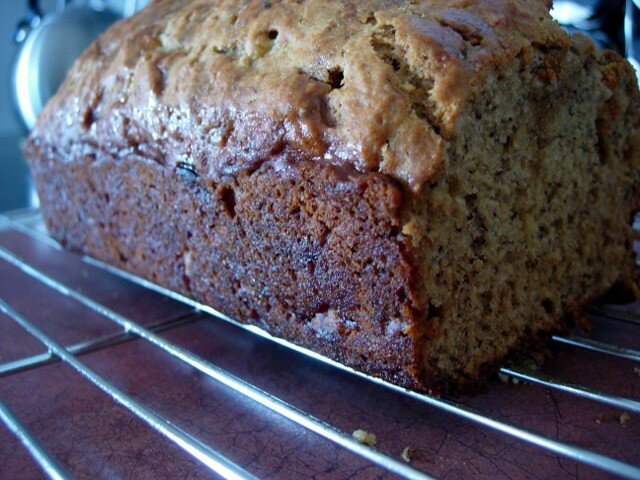 on Saturday morning i made a delicious loaf of banana bread and chocolate chip banana muffins (from the same recipe), and the magic touch... wait for it... was maple syrup drizzled on top when they were fresh out of the oven. i poked holes in both the loaf and muffins first (using a knife or fork), so that the maple syrup seeped inside and created small pockets of ever-so-delightful goodness! this simple trick also helps keep the bread moist. 1. preheat oven to 350F (180C). lightly butter 2 loaf pans or 1 loaf pan and 10 cups in a muffin pan. 2. in a large bowl, mix flour with baking powder and soda, and salt. / in a second bowl, mash bananas with a fork (do not puree in a blender or food processor!). / in a small bowl, whisk eggs with sugar, butter OR oil, and vanilla. stir in bananas. / pour wet mixture into flour mixture and mix just until all ingredients are moist (do not overmix). 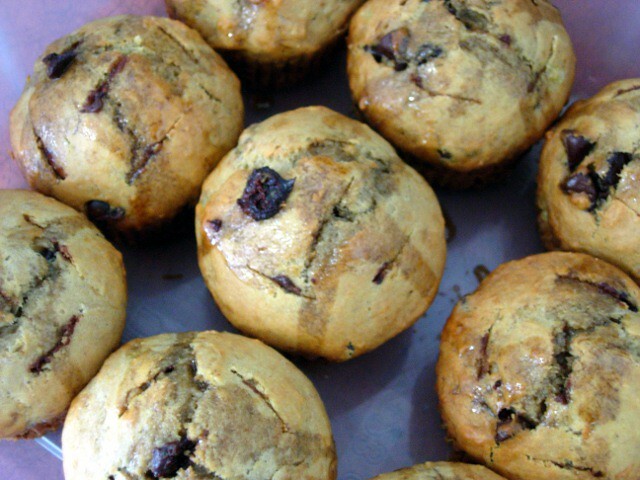 3. spoon into prepared loaf pans OR spoon half of batter into loaf pan and stir in chocolate chips before spooning remaining batter into 10 muffin cups. 4. bake on same rack in centre of preheated oven until a toothpick inserted into the centre comes out clean, 40-45mins for loaves and 25-30 mins for muffins. 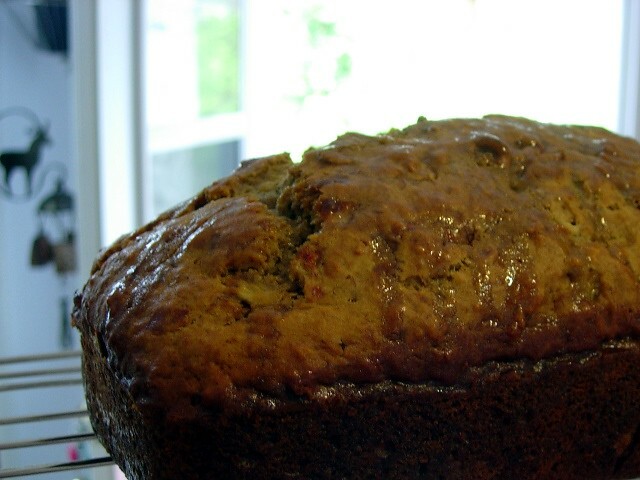 5. immediately drizzle 1/4 cup (or more!) 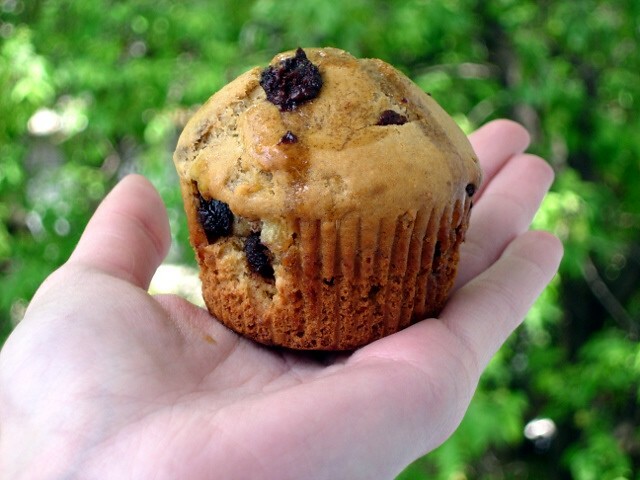 maple syrup over each loaf and 1 tsp syrup over each muffin (poke holes with a knife, fork, etc. first if you want the syrup to seep inside). let stand 10 mins, then run a knife around inside of loaf pan and each muffin cup. carefully turn out. i also recently discovered another delicious use for maple syrup. i was cooking a batch of perogies but had no sour cream to garnish them and quickly had to improvise. after sauteeing the perogies in butter until perfectly golden (i boiled them first, of course), i poured in maple syrup and continued cooking just long enough for it to heat up and start to thicken and caramelize (don't cook them for too long with the maple syrup or you risk burning the syrup!). 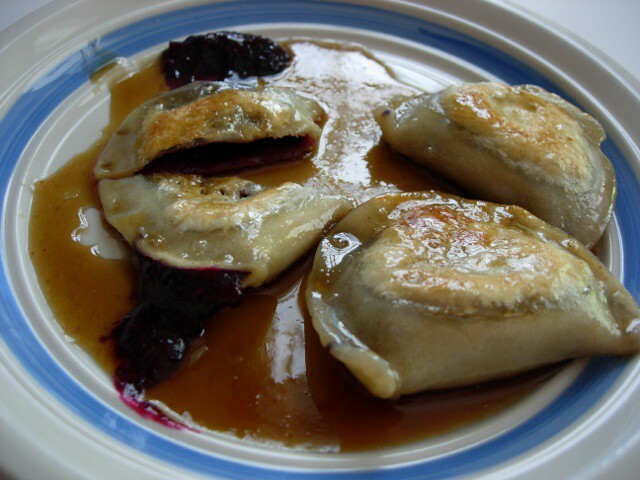 they turned out SO delicious, this is now my new favourite way to eat perogies (a longstanding family culinary tradition). 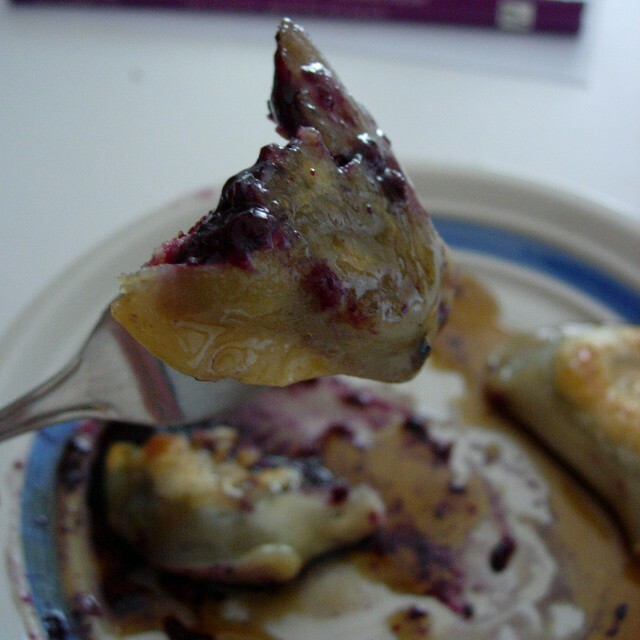 i tried it again yesterday with blueberry perogies... i couldn't have anticipated how divine the combination of cooked blueberry and maple would actually be! what is your favourite way to use or cook with maple syrup? oh. my. god. i am drooling right now. good thing i get to live with such a culinary delight as yourself. oh yeah, definitely was amazing to eat those muffins fresh out of the oven. but um HELLO - where was i for blueberry/maple pyrohy goodness? MMMmmmMMM. i ate them for lunch, silly! you weren't home. but thanks for the love! i love making maple balsamic vinaigrette for yummy salads. and i don't know if this is odd but i smother bacon in maple syrup, it' so good! oh, yum! i heve never made my own maple balsamic vinaigrette, even though it is one of my absolute favourites! do you just use maple syrup, balsamic, and oil? yep, usually just maple syrup, balsamic, olive oil and pepper. perfect. i shall give her a whirl (or shake, rather). i can't stop thinking about maple syrup.